﻿﻿”Knowledge” and “Research” have become key terms for design. The reciprocal relationship between design practice and production of knowledge has been elementary for the discourse amongst the design research community. One of the central aspects refers to the question regarding the context of appliance, reflected in the paradox situation: on the one hand production of knowledge approaches problems of societal relevance, on the other hand, commercial aspects become obvious, relevant and possible. Considering (scientific) Research as a subset or “branch of design” as Ranulph Glanville does it, we shall keep in mind the different directions design research traditionally approaches: one referring to the theoretical knowledge enlarging and consolidating design’s professional working practice. The other referring to practical interventions, which can, in turn, be transferred and re-contextualized in a theoretical (design) field of knowledge. Design research practice relating to things and their impact on social action, lead to general and methodological questions about how to describe and analyse such constellations. The interdisciplinary contributions to this edition, resulting from last year’s DGTF conference in Berlin, point up how practical and theoretical design knowledge, along aesthetic, epistemological, cultural, social and economic boarders, is being perceived and disputed within this field. The topics discussed in this book reach from notions about the Practice of “Entwurf”, e.g. 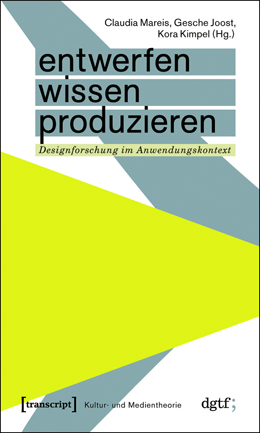 concerning aspects of “Knowing and Not-Knowing” (Peter Friedrich Stephan) or “Hypotheses” (Gert Hasenhütl), to questions around the Research-Through-Design debate (Rosan Chow), Interaction Design Research (Kees Overbeeke et al.) or a general understanding of Design as an implicit culture of knowledge (Claudia Mareis). Overall the book collects both controversial and convincing statements and positions towards the questions how design research that includes experimental design practice, can utilize the researcher’s background as a practitioner, and make the practice become an elementary part to the research. This entry was posted in design research, german/deutsch, Literature, philosophie, research and tagged Claudia Mareis, design research, Designforschung, Deutsche Gesellschaft für Designtheorie und -forschung, DGTF, Gert Hasenhütl, gesche joost, Kees Overbeeke, Kora Kimpel, Mads Nygaard Folkmann, Rosan Chow, tom bieling. Bookmark the permalink.